About a month ago my trusty headphones finally broke. A pair of Sony MDR-V300‘s, they had lasted me YEARS, surviving constant transport between work and home and daily use. The wire connecting the right-side swiveling ear cup finally had enough twisting and snapped, so the search for new ‘phones began. I asked for people’s opinions on Twitter & Facebook (thanks everyone!) and recommendations were expectedly all over the board. Two repeat cries emerged: the Sony MDR-V150‘s and anything made by Sennheiser. I’m pleasantly surprised so many people love the V150’s, as I went through TWO pairs of those BEFORE I had the V300’s! They were really awesome for the price and I would definitely recommend them to anyone as a great pair of lightweight, everyday, universal headphones. Continuing my exploration into the ever-subjective world of headphones, though, I decided to purchase TWO pairs: one for home and one for work (to eliminate wear-and-tear) and ended up settling on the Sennheiser HD428‘s and Panasonic RP-HT360‘s. When deciding which pair I liked best, after they both arrived, the Sennheiser HD428‘s were the clear winner. To my ears, they offer a “fuller,” warmer sound. I’ve read that they tend to be a bit bass-y, but for my mostly orchestral listening habits they’ve worked great. The cord is a nice, convenient length – about 3-feet and wicked thin – and they’re extremely comfortable to wear. The padding on the headband helps them rest on top of my head, and the slightly pivoting ear cups allow them to conform comfortably to the sides of my head. All in all, they fit nice, sound nice, and I’m very happy with them (I also bought them refurbished, so they were less than 1/3 of the retail price). Thanks to everyone for suggesting I check out Sennheiser! The Panasonic RP-HT360‘s also work really well, but compared to the Sennheiser’s I just don’t like them quite as much. The sound is much fuller than my previous ones, but these sound just a bit “tinny” to me, like they’re favoring the treble a little too much. The top part of the headband, where the plastic is split into 2 thin bars, actually is much more annoying than I originally thought. They offer no padding and after time, they begin to dig into your head a bit (or at least, for ME they do as I have very little, thin hair). They do “retain” sound better than the Sennheiser’s — which, I’ve read, isn’t necessarily a good thing — but is good for me, as I use them at work with other people around. The ears cups are slightly larger than the Sennheiser’s and aren’t quite as soft, either, and the cord is over 6-feet-long (!) which is annoying at work because I end up with a birds-nest pile of cord on my desk. But, again, they’re better than my previous ‘phones and I don’t dislike them — they’re just the lesser of the two pairs. My use, by the way, is largely for daily listening while I’m working at my computer. I put ’em through a good mix of genres, from electronica to rock, scores to indie pop, folk to rap, and I notice audio quality issues, but in general I’m severely not an expert. I do do occasional audio & video editing, and so far they’ve held the typical “I had no idea that song had xylophone in the background!” novelty I’ve always heard about. But in the end, I know I’m not as needy as supreme audiophiles, DJs, and foley artists, so these’ll work just fine. So now that I have these, what SHOULD I have gotten? 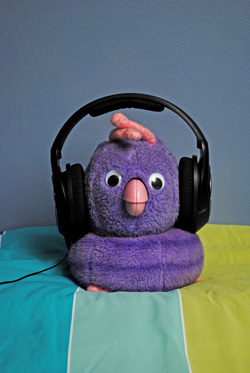 Is there a pair of headphones you particularly love? 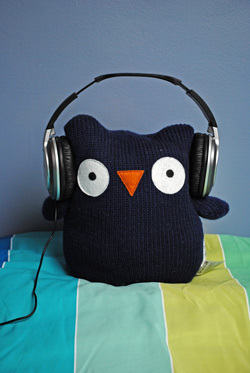 And who would you rather listen to music with: the shocked owl or the fob? Update, February 2016: Over five years later, I’m happy to report both pairs of headphones are still going strong. The Panasonic’s top plastic did crack a few years in, but some electrical tape repaired it and they’ve been fine ever since; sound is still good and they’re still my daily work headphones. The Sennheiser pair have started to “shed” the black material covering the foam, resulting in little black specks left on my ears, but they sound just as good as they did when I first bought them.